That moment when you realize that there really is a Naughty/Nice list. I fell in love with this little girl when I saw her, head in hands, sitting in the overstuffed chair. Who can’t relate to what she’s feeling? We’re always sitting on the cusp of a new day. The little girl is from The Terrible Thing That Happened at Our House by Marge Blaine and illustrated by John Wallner. Santa — and I love the grim look on his face, like he’s thinking, This is the downside of my job, but I’ve got to do it — is from Sandra Boynton’s Christmastime! I have been a HUGE Sandra Boynton fan since I first picked up a “Don’t let the turkeys get you down” mug at Logos Bookstore on Marshall Street in Syracuse in, maybe, 1980. I think we still have it. Once, probably 20 years ago, we drove to Stamford, NY, where she had an exhibit at an art center. She autographed some board books for us, but mostly I wanted to meet her. When I found her book at the thrift store, I felt a little sad that someone abused and discarded it. At the same time I was thrilled at the chance of giving it new life in scenes like the one above. The flooring in the room is from Ox-Cart Man (illustrator – Barbara Cooney). The wallpaper is some leftover origami paper. I really enjoyed this – loved that you quoted Anne of Green Gables, it’s a nice thought overall, but mostly I love the little comic that you’ve created on top. It’s such a lovely idea! Thank you! I have a lot of fun making my collages. I love her board books. I saw that she has one that can be personalized now, which may be really fun for a little person. Great choice for C. Love the Anne of Green Gables quote. I recognized the wallpaper from origami paper I once had! Yes, we’ve all been where that little girl is. And a book like that is perfect for rescuing and giving new life. Haha — I love that your recognized origami paper. It’s very wallpaper-ish, don’t you think? 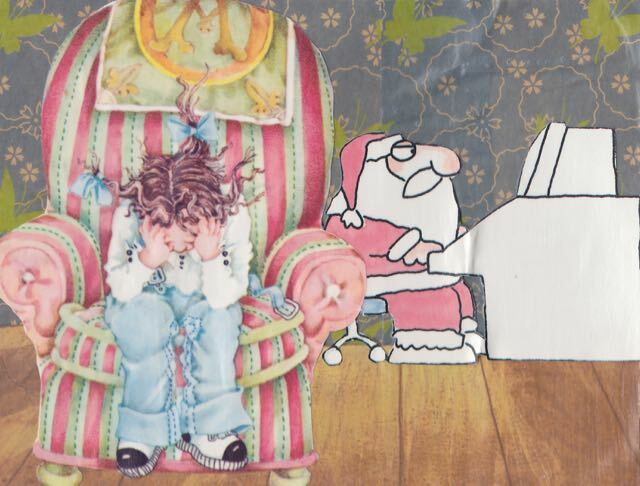 I wondered what Santa was playing on the piano. I haven’t read either of the books you mention, but I like the pictures. I guess it could look like a piano. I’m fairly sure it’s a computer. Santa is pretty up-to-date. The caption just seemed to fit. The pictures in Ox-Cart Man are so lovely that I feel a little guilty cutting them up, but it’s a paperback and the glue has given up on holding the pages in. I love how positive Anne always is! This quote reminds me of a saying I have hanging on my wall “Today is a good day for a good day.” I see it every time I walk out of the door. What a fun mashup! I look forward to your future posts (I’ve added you to my WordPress reader). Goodness, I can so relate to your son! And yes, thank goodness for Ann Shirley, and all those like her.